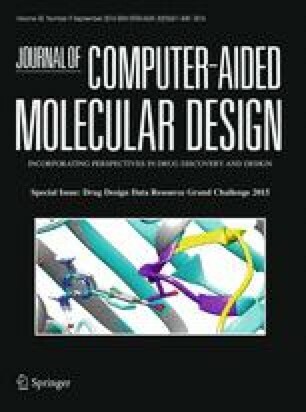 The D3R 2015 grand drug design challenge provided a set of blinded challenges for evaluating the applicability of our protocols for pose and affinity prediction. In the present study, we report the application of two different strategies for the two D3R protein targets HSP90 and MAP4K4. HSP90 is a well-studied target system with numerous co-crystal structures and SAR data. Furthermore the D3R HSP90 test compounds showed high structural similarity to existing HSP90 inhibitors in BindingDB. Thus, we adopted an integrated docking and scoring approach involving a combination of both pharmacophoric and heavy atom similarity alignments, local minimization and quantitative structure activity relationships modeling, resulting in the reasonable prediction of pose [with the root mean square deviation (RMSD) values of 1.75 Å for mean pose 1, 1.417 Å for the mean best pose and 1.85 Å for the mean all poses] and affinity (ROC AUC = 0.702 at 7.5 pIC50 cut-off and R = 0.45 for 180 compounds). The second protein, MAP4K4, represents a novel system with limited SAR and co-crystal structure data and little structural similarity of the D3R MAP4K4 test compounds to known MAP4K4 ligands. For this system, we implemented an exhaustive pose and affinity prediction protocol involving docking and scoring using the PLANTS software which considers side chain flexibility together with protein–ligand fingerprints analysis assisting in pose prioritization. This protocol through fares poorly in pose prediction (with the RMSD values of 4.346 Å for mean pose 1, 4.69 Å for mean best pose and 4.75 Å for mean all poses) and produced reasonable affinity prediction (AUC = 0.728 at 7.5 pIC50 cut-off and R = 0.67 for 18 compounds, ranked 1st among 80 submissions). The online version of this article (doi: 10.1007/s10822-016-9982-4) contains supplementary material, which is available to authorized users. This work was in part supported by Grants-in-Aid for Scientific Research from the Japan Society for the Promotion of Science (Grant Numbers 25430186 and 25293079) and from Japan Agency for Medical Research and Development (“The adjuvant database project Grant Number 16ak0101010h0005”) to K.M.